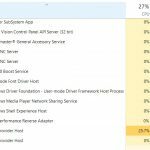 Is the Microsoft Compatibility Telemetry service using up a huge chunk of resources on your Windows 10 PC? Read this article to learn all about the Microsoft Compatibility Telemetry service. We will also throw light on why is it utilizing high disk and CPU resources. Additionally, you will learn how to get rid of this annoying problem. Microsoft Compatibility Telemetry is a Windows 10 built-in service. It collects vital data about your OS and sends them periodically to the Microsoft development team. The Microsoft DevOps team analyzes the data and fixes technical glitches to enhance the user experience. System security analysis is performed with the data collected by the Microsoft Compatibility Telemetry service. The idea is to make Windows 10 more secure to fight against new vulnerabilities and threats. Performance optimization is another reason for using this service. Data gathered from hardware and device drivers are analyzed to fine-tune system performance. User experience matters a lot to Microsoft. The Microsoft Compatibility Telemetry utility can provide valuable insight on user requirements. It helps the Microsoft team to develop the OS on a par with user expectations. Is it a Spying Software? Some users are apprehensive about this service and consider it to be an alleged spying software. Microsoft, however, has repeatedly clarified that it collects data solely for developmental purposes. The Microsoft Compatibility Telemetry service doesn’t collect any confidential personal information. The data collection process is confined to the operating system, its components, and services. But in case you are still concerned about privacy, you can always disable this service on your computer. All you need to do is to go through this tutorial and follow the steps listed below. What Type of Data is Collected by the Microsoft Compatibility Telemetry Service? The Microsoft Compatibility Telemetry service collects data that are solely related to your operating system functionalities. In addition, it can also access hardware information and device driver details. Here is a brief summary of data that are usually collected by the Microsoft Compatibility Telemetry service. It collects keyboard data in the form of text inputs. The tool transmits user interactions with Cortana (Microsoft Windows Live Assistant). It shares detailed information about the types of multimedia files present on your hard drive. First usage reports on various peripheral devices, like the webcam, microphone, and external pointing device, are collected by the MS compatibility telemetry service. It collects information about hardware specifications. Device driver details are also collected and shared. When you upgrade, rollback, or remove a specific driver software, the tool sends automated reports to the Microsoft team. Information about various Windows components, scripts, and programs are also collected. This should give you a rough idea of what type of data is collected and shared by the Microsoft Compatibility Telemetry service. It doesn’t collect any user-specific information, such as your browsing history or geographical location. Nor does it track photographs, videos, documents, and other personal artifacts. Why Microsoft Compatibility Telemetry Consume High Disk/CPU Resources? The Microsoft Compatibility Telemetry service is integrated with operating system components. This includes hardware devices and administrative scripts. It remains enabled by default and keeps track of all system activities right from startup to shut down. The service always runs in the background, utilizing CPU and disk resources in the process. Resource utilization can spike up while collecting data. The same holds true for sharing the collected data with the Microsoft team. It’s a continuous process for which the system must allocate dedicated CPU/disk resources. With depleted resources, the computer often fails to support other user activities. It simply refuses to run programs that are resource intensive in nature. That’s precisely the reason behind extreme system slowness and high resource consumption. We have explored several methods to get rid of the high resource utilization caused by the Microsoft Compatibility Telemetry service. Let’s find out the step-by-step procedure to disable this service on your Windows 10 computer. Open the Run dialogue box by pressing Windows + R keys together. The next step is to open Command Prompt with administrative rights. Type “cmd” in the Run input box and then simultaneously press Control + Shift + Enter. Do not click on the “OK” button, as it will open the Command Prompt interface without admin privileges. Now copy + paste the following code snippet and press the Enter key. This will instruct the Windows registry editor to disable the data collection service. Close the Command Prompt window and restart your system. Once the computer boots up, open Windows Task Manager. Check the resource utilization for the Microsoft Compatibility Telemetry service. You will most probably notice normal resource usage patterns without any visible spikes. The first method should be enough to solve the problem for you. But if you still observe high disk/CPU utilization, then move on to the next method. This method will take you through the process of disabling Windows data collection using the Group Policy Editor. You will need admin privileges on the computer to perform this activity. Press Windows + R keys together to open the run utility. Type “gpedit.msc” and press Enter. Navigate to Computer Configuration > Administrative Templates > Windows Components > Data Collection and Preview Builds. Double-click on the “Allow Telemetry” link. 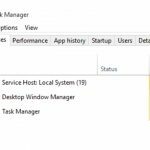 READ How to Fix a WSAPPX High Disk & CPU Usage Issue? Click on the “OK” button to save the changes. 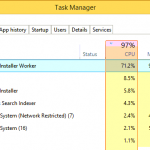 Restart your computer and go to the Task Manager to check whether it has fixed the issue or not. Move on to the next method if the problem still persists. If the Group Policy Editor fails to prevent the issue, here’s the next step. You can try to disable Microsoft Compatibility Telemetry through the Registry Editor. Open the Run utility by pressing Windows + R keys simultaneously. Type “regedit” in the input field and press Enter. User Account Control will ask for your permission to open the registry settings. Click “Yes” to continue. Browse to HKEY_LOCAL_MACHINE > SOFTWARE > Policies > Microsoft > Windows > DataCollection. Right-click on “DataCollection” and select New > DWORD (32-bit) Value. In the Value Name field, type “Allow Telemetry.” Set the Value Data to “0” and click on the “OK” button. Now you need to reboot your PC for the changes to take effect. 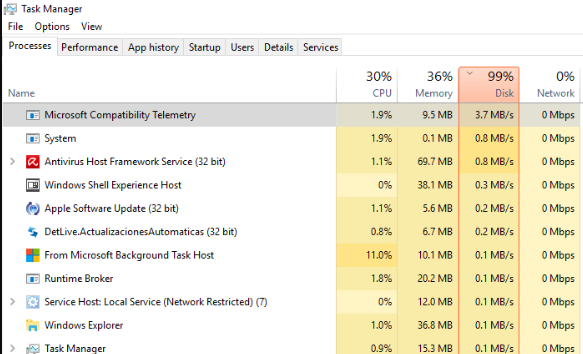 Upon restart, go to the Task Manager and check to see if the high memory/CPU utilization issue is resolved. If you still observe high resource consumption for the Microsoft Compatibility Telemetry service, try out the next method. You can make use of the Windows Task Scheduler interface to disable the CompatTelRunner utility. This utility acts as the trigger to run the Microsoft Compatibility Telemetry service. It will stop the service from running in the background. Press Windows + R keys together to open “Run” dialogue box. Type “taskschd.msc” and click on the “OK” button. Click on “Microsoft” to expand the section. Similarly, expand the “Windows” section next. Search for “Application Experience” and click on it. It will bring up a new window where you can see a list of scheduled tasks. Locate the task named “Microsoft Compatibility Appraiser.” Right-click on it and select “Disable.” It will disable the Microsoft Compatibility Telemetry service. Now go to your Task Manager interface. You will not see the Microsoft Compatibility Telemetry service in the list of running processes. It will eventually release the CPU/disk resources that were previously consumed by CompatTelRunner.exe. The majority of users successfully resolve this high CPU/disk utilization issue by disabling this service. In case you are still facing the problem, follow the next method to permanently remove the CompatTelRunner.exe file. CompatTelRunner.exe is the executable program file that manages the Microsoft Compatibility Telemetry service. You can delete this file from your computer to permanently stop the Microsoft data collection service. As it is a system tool, you will need administrative rights to remove the program. Log in to your PC as an administrator. Browse to the C:Windows\System32 directory. A new window will pop out. Select the “Owner” tab and then scroll down to click on the “Edit” button. This will open up a list of all user accounts on this particular computer. Select the administrator account that you are currently using and then click on “Apply.” Now you have complete ownership of the file. Open the “Permissions” tab and select your administrator account. Now tick the check box next to “Full Control” under the “Allow” column. It will give you the permission to delete this file from your computer. Go back to the System32 folder and select the “CompatTelRunner” file. Press the Shift + Delete keys together. This will permanently remove the utility from your computer. That’s all you need to do. You have removed the CompatTelRunner utility permanently. The Microsoft Compatibility Telemetry service will no longer run in the background. That should be enough to resolve your high CPU/disk utilization issue permanently. In this article, we have summarized what the Microsoft Compatibility Telemetry service is. You have also come to learn the reasons behind its inclusion in the Windows 10 package. Moreover, we have also listed the procedure to disable/remove this service. We hope you have found the tutorial useful. All that is required from your end is to follow the step-by-step procedure as discussed above. Rest assured, you will no longer see high CPU and disk utilization caused by the Microsoft Compatibility Telemetry service. How to Fix "err_spdy_protocol_error" in Google Chrome?